Peter Higgs is best known as the theoretical physicist who gave his name to the Higgs boson. The boson explains why other elementary particles - the basic building blocks of the Universe - have mass. Higgs was born in Newcastle upon Tyne in 1929, the son of a BBC sound engineer. His family later moved to Bristol, and the young Peter Higgs proved a brilliant student, winning many prizes at Cotham Grammar School - though not any in physics. But it was here that he was first inspired by the work of Paul Dirac, one of the physicists who helped lay the foundations for quantum mechanics. This led him to study for his PhD at King's College London. After finishing, he applied for a lectureship at the London university, but lost out to a friend. He headed for Scotland instead. It was here that Higgs proposed his famous mechanism. Other researchers were working independently on the same idea, publishing papers at the same time as Peter Higgs. These other theorists included the Belgians Francois Englert, who shared the 2013 physics Nobel with Higgs, and Robert Brout (now deceased); and later the Americans Gerald Guralnik and Carl Hagen, and Briton Tom Kibble. Yet by the early 1970s, it was Higgs who was being associated most in academic papers and conferences with the theory. This led to the particle acquiring his name - informally at first, but it soon stuck. However, whilst well known in academic circles, Higgs was not yet a household name. He continued to write and teach; he married, but split from his wife a few years after his two children were born. Friends feel he did not have the impact in his career expected of a scientist of his calibre. "I wouldn't say he was shy. I might say that he was a little too retiring perhaps for the good of his own career," said Prof Michael Fisher, now at the University of Maryland, US. Attention on the Higgs boson increased in recent decades, especially after scientists behind the $10bn Large Hadron Collider (LHC) at Cern in Geneva made discovering the particle a key priority. Failure to detect the Higgs at the LHC's predecessor - the LEP - had elevated it to one of the most sought-after prizes in science. Higgs had never been completely comfortable with the attention it brought - or the association of his name with it. But he came to be more accepting as the years rolled on. In July 2012, physicists at Cern announced the discovery of a particle consistent with the Higgs boson. He was in Geneva to hear the news, and wiped a tear from his eye as scientists made their announcement. The news immediately led to calls for Prof Higgs to be knighted and for him to be awarded a Nobel Prize - perhaps along with others who had come up with the theory in the early 60s. 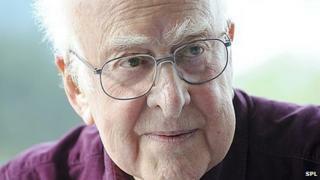 Reacting to the discovery, Peter Higgs told reporters: "It's very nice to be right sometimes." Best explanation of Higgs boson? Image caption Scientists' best theory for why different things have mass is the "Higgs field" - where mass can be seen as a measure of the resistance to movement. The "Higgs field" is shown here as a room of physicists chatting among themselves. Image caption A well-known scientist walks into the room and causes a bit of a stir - attracting admirers with each step and interacting strongly with them - signing autographs and stopping to chat. Image caption As she becomes surrounded by admiring fans, she finds it harder to move across the room - in this analogy, she acquires mass due to the "field" of fans, with each fan acting like a single Higgs boson. Image caption If a less popular scientist enters the room, only a small crowd gathers, with no-one clamouring for attention. He finds it easier to move across the room - by analogy, his interaction with the bosons is lower, and so he has a lower mass.